The stage is bare apart from 21 chairs in two diagonal rows, nine on one side, 12 on the other. But it’s not until near the end of Lagrime di San Pietro that the singers actually sit on them for the first time. 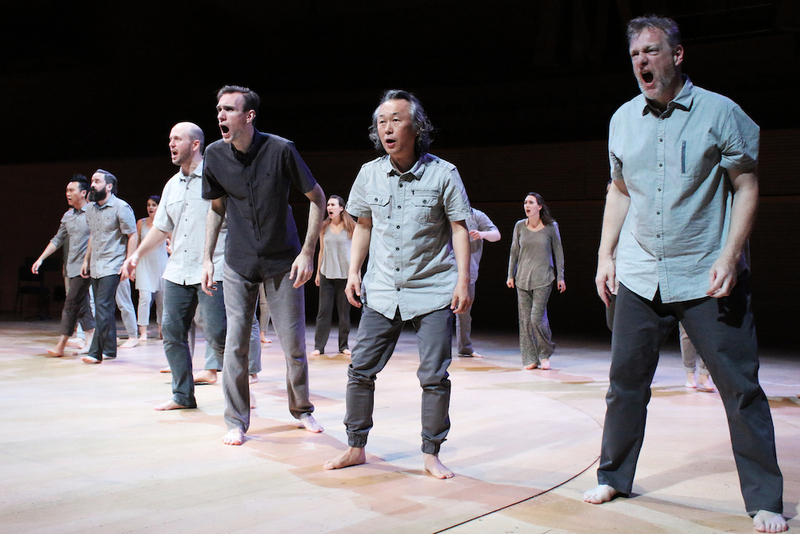 Mostly, they sing while performing the compelling, poetic, physical choreography that Peter Sellars has crafted on them to drive deep into the emotional heart of the Renaissance a cappella masterwork. Born in The Netherlands in 1532, Orlando di Lasso composed over 2000 works including 300 masses. He wrote Lagrime di San Pietro, an achingly sorrowful piece about St Peter’s denial of Jesus Christ before he is taken away to be crucified, knowing that it would be his last composition. Ill and in pain, Di Lasso died in 1594 three weeks after finishing the extraordinary piece of polyphony. Written in 21 sections, Di Lasso used poetry by Italian Renaissance poet Luigi Tansillo for the first 20 madrigals, and added a Latin motet at the end. Each is written in seven-part harmony. When Grant Gershon, Artistic Director of the Los Angeles Master Chorale, decided to perform the piece for the first time in 2016 he convinced renowned director Peter Sellars to help stage it. Gershon and Sellars decided to use three singers for each part – hence 21 singers performing the 21 sections, all sung in exquisite ensemble counterpoint. It is luminously beautiful music. Using a chiaroscuro effect, dark sounds are flecked with light, as the composition uses serene melodies, which build dramatically, gentle dissonance and modal shifts evoking the guilt, fear and profound remorse of Peter, and the ingratitude felt by Jesus. Jenny Wong, who conducts the piece here as part of the Melbourne International Arts Festival, leaves evocative moments of silence between each madrigal, or madrigale spirituali (spiritual madrigal) . Sellars has avoided using any religious iconography for the staging, instead it is performed on an open stage, bar the chairs, as a moving humanistic look at the relationship between the two men at an intense hour of need, with Peter haunted thereafter by his betrayal, begging eventually to be allowed to die, and Jesus feeling the ingratitude as fiercely as the physical pain. The singers wear casual, contemporary clothes in various shades of grey (costume design by Danielle Domingue Sumi) and are bare-footed. Wong is dressed the same. In an extraordinary feat for such complex music, they have memorised it, which frees them to commit fully to Sellars’ physical embodiment of the text. The choreography sees them use gestures to convey each emotion – clutching at their hearts, holding their faces in their hands, touching their cheeks to suggest tears, raising their arms to heaven and slapping the stage. They hug, and kiss gently at one point. They even perform lying on the ground, both on their back and their front, with the ecstatic sound hardly affected, giving it a slightly strange but still absolutely beautiful quality. Wong also moves around the stage on occasion to conduct from a different position, and leads the singing crouched on one knee at times as she shares the physical poetry with them. Yet the choreography never overwhelms or distracts from the music. It feels organic, subtle and heartfelt and somehow makes the experience feel emotionally complete. Sublime. Limelight caught up with John Adams and Peter Sellars to find out what an opera set in the Californian Gold Rush has to say about Donald Trump’s America. John Adams’ new opera proves there’s gold in them thar girls.